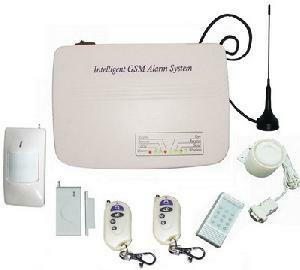 The Burglar alarm system G10E/EA adopts SMS data transmission and voice platform of GSM network to send control command and receive alarm remotely. The system can be set delayed-arm. When a signal is detected by detectors, the detectors will send alarm signal to host immediately, then the host sends alarm SMS to its pre-set mobile phone numbers, and meanwhile dials its pre-set telephone/mobile phone numbers automatically and drive wiretap. In addition, users can dial the system and set it in arm/disarm mode by any phones. * Adapt wavecom double frequency GSM module. * Send SMS to 3 mobile phones automatically while alarming. * Call 3 phones automatically while alarming and drive wiretap. * Arm/disarm by wireless keyboard, remote controller, SMS or remote telephone/mobile phone. * Set the host by wireless keyboard, SMS or remote phone. * Report guarding zones remotely by SMS or voice. * Modify the name of wireless guarding zones and inquire the status of host by SMS demand. * Support two-way communication can be used as handfree telephone. * With standby rechargeable battery. * The alarm host automatically stores system status, while its power is off. * Connect with the alarm center through GSM network.